Rich, handsome, and talented, gymnast Alec Maes has it all. He’s one lucky guy. But just when he’s about to leave for the Summer Games in Rio, his luck seems to be running out. A dying mother, bone-deep betrayal, and a floor routine he can’t stick threaten to steal his dream of a gold medal. That is, until a beautiful gymnast with snow-white skin and full red lips alters his life with the whisper of her name. 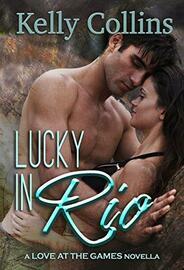 Collette Lamont doesn’t believe in luck. She believes that mixing hard work with opportunity creates success. When her world collides with Alec Maes’s, she knows something wonderful is part of her destiny. It’s more than just the incredible heat between them. He is everything she wants, and she is everything he needs. Join Alec as he discovers that sometimes the love of the right girl can take you straight to the top.